Inspired by my colleagues at Super Eco, I asked Tomas if he could build me some raised beds so we could have fresh veggies all summer long. 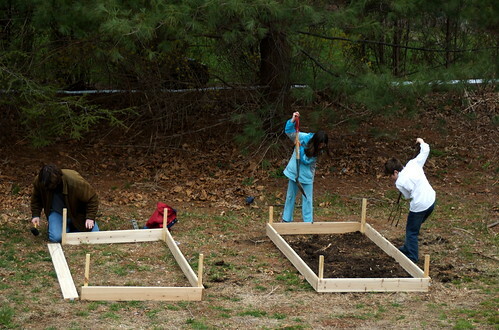 It was a great opportunity to get the kids involved, too, with loads of measuring & fun calculations – for some reason none of us could get our heads around the concept of a cubic square foot – and lovely dirt to dig into. Next up is a vote on what to plant! Great idea! Have you seen NWF’s newest web site, Garden for Wildlife? There are some great tips there that you and your kids might like! I love this idea because it gets the kids involved, and they’ll remember it always.